You may have noticed that one of my regular features — Fitness Adventures took a little bit of a summer vacation. I mean sometimes we all need a break right? Things have been — well for lack of a better word — busy. Baltimore may be small — but when it comes to getting sweaty — it is mighty. So mighty in fact I cannot possibly get to every studio AND share them with you on my own. I need help! So — I've enlisted the help of some of my very best fitness gal pals to give me the inside details on their favorite workout spots. Get ready because Fitness Adventures are back in a BIG way. Courtney Ferreira aka Real Food Court. Throughout my fitness career I have done it all. While sports were never my strong suite, I found a love of moving my body as a result of participating in organized sports. I have done boxing, CrossFit, cycling, barre, yoga, heavy weights, and everything in between. My relationship with exercise has really shifted as I have gotten older. While each phase of my fitness journey has been centered around different times of my life, I have really gotten to know my body. As a result, I am much better at listening to my body. Gone are the days of destroying every muscle in the gym. I now focus on moving my body in a way that feels good for me that day, and no longer feel guilt over 'missing a day'. This more intuitive take on exercise has been lovely and I would argue that I don't just feel my best, I also look my best. Since there is no pressure to stick to a plan, I enjoy exercise more and feel encouraged to check out more local studios. Alight on to the good stuff. Courtney Ferreira, a registered dietitian nutritionist, long time fitness enthusiast and newly minted NASM-CPT is here to share with you one of her fav places to get sweaty. 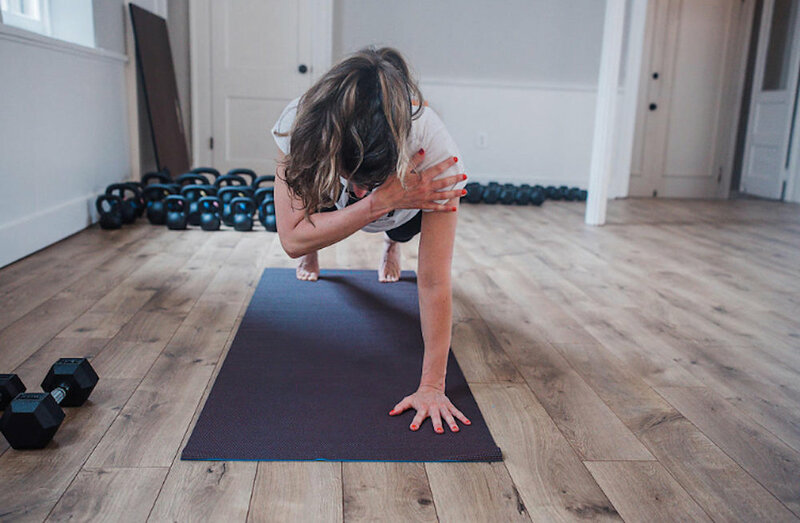 LIFT, which is a one of a kind yoga + strength training studio located in Baltimore's charming Mount Vernon neighborhood, is one of her regular spots — and here’s why. Alexa, the awesome girl-boss and owner of LIFT has created a space of no other, as she says, "mindfulness meets muscle". She describes the studio as a place to "get strong, grounded, and spiritually aligned in a welcoming, uplifting environment". LIFT is truly a place for everyone, every body, and all fitness levels. Classes are easily adapted to your fitness level and she also hosts awesome workshops for people hoping to build a stronger base. The classes vary from FLOW and RESTORE yoga to cross training classes such a LIFT [signature class using weights], BOLT [circuit with some running/walking involved], and BODY [body weight circuits]. All of the class include a gentle warm up with some notes of yoga, that can often feel like a workout themselves. You will leave sweaty and empowered, instead of run down and exhausted. THAT is what I love. So lets explore. When you first enter you see a beautiful clean white space. It honestly feels like a spa. There are essential oils and plants and just an overall calming setting. The entry level has the check in desk, bathrooms, two showers and plenty of benches, cubbies, and coat hooks. To your left are the stairs up to the studio. Lining the stairs are mats, blocks, towels for you to grab if needed. When you reach the space it is honestly breathtaking. The high ceilings and clean crisp white and grey colors plus the original stained glass windows and plenty of natural light make a totally unique space. There are kettle bells, dumbbells and medicine balls in the back of the room to grab if they are needed for the class. You'll find prices right on par with other Baltimore Yoga studios - even though Lift is adding the extra perk of strength to the mix. Bonus your first class is free — which is always a good way to try something new. A drop in class will cost you $20- so be financially responsible and get yourself a class pack. 10 classes for $140 brings the price down to $14 a pop. Of course if you're ultra hooked — and let's be real it's only a matter of time — you can get the unlimited membership for $99- a month. Chill out with tea in their cute drink station up front — as well as water available for purchase. Alexa is constantly coming up with great workshops and class series that may be very appealing to new or current clients. The no judgement zone is real. I love that there is a great mix of men and women are always guys in the classes [see, its for everyone]. You’ll also notice that there are NO mirrors. This is a space everyone can feel good in. The beautiful space is frequently used for some awesome events including Discover Charm City's recent Gal Pal event for August, and a speaker panel hosted by Arrow. The best part? EVERYONE gets a cold essential oil towel during cool down. Give yourself extra time to park when you go for the first time. It is street parking only. I have never had an issue parking however if you are not familiar with Mount Vernon I would give yourself those extra few minutes. A lot of streets are one way so you may find yourself needing to make a loop. I have never walked more than one block, on Saturday the meters on the right side of E. Madison St are free and on Sundays all of the meters are free including those along N. Calvert in front of the church. There is plenty of unmetered parking too. Give yourself time the first time if you aren't familiar with the area. What you really want to know - all the class details right? This is the signature class! It is amazing. There is a yoga style warm up for about 15 minutes, a workout that will last about 30 minutes and will use different props. There are typically weights or kettlebells involved. Don't worry though, you always have the option to choose your weight or drop the weight if you're not feeling it. You end with a yoga style cool down and a cool towel! Get sweaty, challenge those muscles, and get energized. The yoga classes are great. They are not 'hot' so don't worry about becoming dehydrated. You will feel challenged through the yoga classes and be able to enjoy all of the benefits without worrying about passing out. This has become my favorite class. As with LIFT it starts with a yoga style warm up, a body weight workouts and then a cool down. This class is just wonderful. You can show up if you're tired or just not feeling it because the body weight aspect makes it feel more manageable yet you still will sweat and get a workout. I love how sore I get from these classes. It is just great to realize that you can get such a good workout with your body alone. The class is Saturday morning and I highly recommend! Any other things you want to share? It is worth mentioning the unique quality of the warm ups. They are targeted towards the type of movements that will be happening during the workout. You really prime your body for what you will be doing which helps the warm up feel purposeful and slightly challenging. I love this because it's not just a generic warm up, the warm up is part of the workout and it is great. I have to say I love this studio, I can't recommend it enough. Whether you love fitness or have been thinking about getting started, I promise you will feel welcome here. No judgement, no intimidation, every body is welcome. Courtney is a registered dietitian nutritionist, long time fitness enthusiast and newly minted NASM-CPT. Be sure to follow Courtney on Instagram and check out her blog for food and nutrition tips and tricks. Know of a studio or gym you’re just dying to check out but want all the details first? Leave a comment and let me know where SLF should adventure to next!